An inspired guide to the daily practice and use of Major Triads, their inversions, permutations and sequences. For Serious Improvisers of All Levels! simultaneously as a chord, or as a single note arpeggio, and is the backbone of Western harmonic function. melodic lines – both “inside” or “outside” of a given key center. It's therefore of primary importance for the improviser to be comfortable and proficient with all aspects of triads, including their inversions and permutations. This should lead to the eventual understanding of how they function, not only as the bottom part (root, 3rd & 5th) of an extended chord (7th, 9th, 11th & 13th), but as the extensions themselves. Although this might sound like a pretty basic topic to an advanced improviser, it's always a good idea to review the subject from time to time, as well as to include triad sequences as part of a daily practice or warm-up routine. It's amazing what one might (re)discover. In this Volume One of “Triadicisms”, the focus is on the Major Triad exclusively. 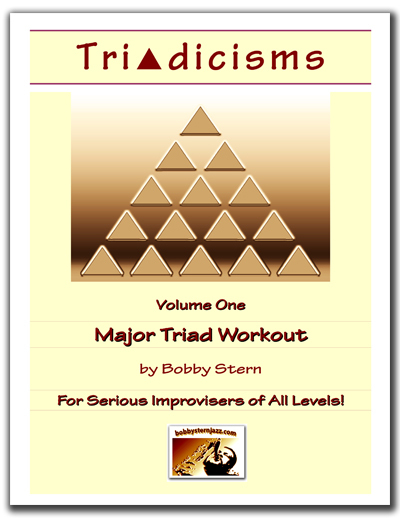 As the command of triads is essential for anyone hoping to be a competent improviser, “Triadicisms - Volume One: Major Triad Workout” is both a great place to start and / or to keep digging deeper.